Life of the Party may have the slightest plot I’ve seen in 2018, and I’m okay with that (seriously, An Extremely Goofy Movie had more narrative thrust than this). In a time when most big Hollywood releases are trying to cram “important messages” down our throats, Life of the Party comes along to give us a good laugh. This is not Melissa McCarthy’s funniest movie, nor her best performance, but it is definitely a fun enough romp in the “turn your brain off” genre that left a smile on my face. McCarthy is Deanna, a proud mother whose husband Dan (Matt Walsh) just divorced her after dropping daughter Maddie (Molly Gordon) off for her senior year of college. Not wanting to move in with her own parents again, Deanna decides to complete her Archaeology degree and attend college with Maddie (who takes this decision unrealistically well). She meets boys, bumps into a mean girl (Disney Channel starlet Debby Ryan), and all the other things people in movie college do. Life of the Party is a movie made to entertain. The cast is having fun, enough of the jokes hit, and the film thankfully avoids unearned sentimentality and feminist messages that ruin so many movies like this. Sometimes a movie just needs to be funny, and for me, this one did the trick. McCarthy and Gordon have nice mother-daughter chemistry, and Debby Ryan works well as the mean girl. Also, look out for Julie Bowen as Dan’s new girlfriend and Maya Rudolph as Deanna’s BFF. 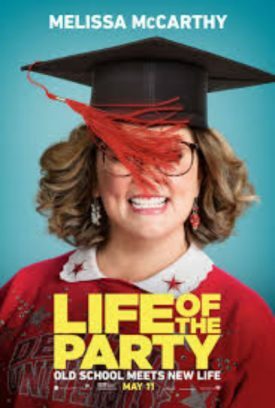 This isn’t particularly memorable, but in a time when Hollywood movies seem more concerned with addressing topical issues than entertaining the audience, Life of the Party is a fun ride that’s worth seeing at the cheap theater.